Bingley's is a small intimate restaurant in the Old Town, Poole, just off the Quay. 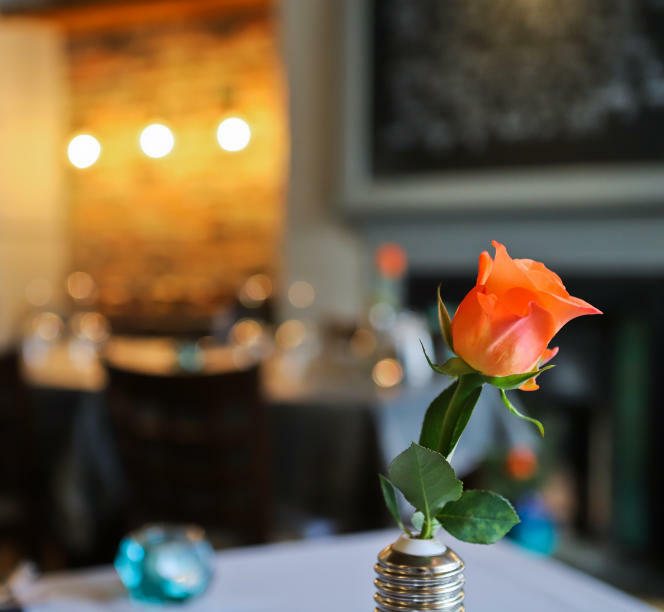 We serve fabulous homemade food in relaxed, tasteful surroundings. We are fully licensed, with a small select wine list and bar. Bingley's is open Tue-Sun 5:30-late. We can accommodate 30 guests, so booking is recommended (by telephone please for reservations within 48 hours). We would respectfully request that guests advise of cancellations as we now operate a waiting list. Bingley’s is part of a 16th Century Grade II* Listed Tudor building, one of the oldest in Poole. The front of the building has been modified over the centuries but in Cinnamon Lane, at the rear, the timber framed gable can still be clearly seen. Take a moment to notice the early 19th Century (circa 1830) painted ceiling with flowers and corner modules. The building was owned at one time by Thomas Bingley, who was a wealthy merchant and Mayor of Poole in 1555. We feel there is a unique ambiance to our little restaurant. We are happy to accommodate groups of six or more by prior arrangement and ordering in advance will enhance your evening with us, especially if you have a theatre or later engagement. We are happy to talk to you about exclusive use of Bingley's for your special event (room hire, menu, additional items).